Smashed windshields and dents are a common occurrence at ballparks. The windshield of a spectator who parked outside of your baseball field was smashed by a foul ball. The spectator presents a $450 bill to the league president asking for reimbursement. Your baseball league carries a General Liability policy through a reputable carrier, so there is no doubt that the insurance carrier will pay the bill, right? Well, probably not. Here’s why. In brief, General Liability policies respond to allegations of negligence and resulting damages to a third party arising from “bodily injury” or “property damage” caused by an “occurrence” that is not subject to the policy exclusions. In the case of a vehicle damage claim, the coverage requirements for an “occurrence” and “property damage” are met. And, there are no exclusions that are likely to apply in this scenario. But, the question remains whether or not negligence was involved and if there are any defenses. If anyone of these elements can be defeated, a claimant technically can’t prevail under the law of negligence. But it gets a little more complicated when certain legal defenses can be used by the league, such as assumption of a known risk. Under the assumption of risk defense, an injured party (such as a spectator) can’t prevail if he or she has assumed a known risk that is an inherent part of the activity. The reason for this legal defense is because the courts want to provide an incentive for the public to protect themselves in situations where they know they are subjected to risk. The assumption-of-known-risk doctrine applies not only to damaged vehicles, but also to spectators injured by foul balls under the baseball rule. In the case of cars parked near a baseball field, fact situations exist where the vehicle driver/owner assumes a known risk. As a result, the claim will likely be denied. Likewise, fact situations exist where the driver/owner does not assume a known risk. That claim will likely be paid. We conducted a study of a large baseball association client where member leagues incurred many vehicle damage claims over the past five years. Below we share some of the findings. As a rule of thumb, the determination of coverage by the claims adjuster depends on the relationship between the driver/owner of the vehicle and the league, and their reason for parking. Car owned by a neighbor and parked in his yard next to ball field. Vehicle parked at the ball field while owner attended an educational class in the nearby gym. Car parked at ball field while the owner attended a function not related to the baseball game. Automobile parked in front of owner’s home close to field. Car parked across the street from ball field when hit by foul ball. Non-patron’s car hit by foul ball. Car hit while the owner was playing tennis nearby. Vehicle parked along street when hit by foul ball. Claimant attending a soccer game when his car was damaged by a baseball. Passerby’s vehicle hit while driving down street. Foul ball smashed windshield of car parked across street. Non-patron vehicle rear windshield struck by foul ball. Claimant parked car at unoccupied field prior to game taking place. Claimant parked and attending a basketball game when his car was struck by baseball. Foul ball struck car driving down street. Claimant parked on street while attending church when car was damaged by a baseball. What do all of these claims have in common? The owner/driver of the vehicle was not attending the baseball game at the time the vehicle was damaged. Since they were not attending the ball game, they did not assume a known risk. Claimant was watching the baseball game when his car was damaged by a foul ball. Umpire was officiating a baseball game when his car was struck. Player’s car damaged by foul ball while he was playing in game. Spectator was watching game when foul ball shattered his windshield. Spectator’s car was damaged by foul ball while in attendance at game. What is the common denominator when the vehicle damage claims are denied under the assumption of risk doctrine? In these cases, the driver of the vehicle was either participating as a spectator, player, or umpire. This group of individuals should know, based on their own experience, that foul balls and home runs are a part of the game and the risks involved to parked cars. Are there exceptions that might be considered on a case by case basis? Some claims adjusters may reach a different conclusion. For example, when a handicapped participant or spectator is directed to park in a specified handicapped parking space. To temper the expectations of spectators and other participants, prudent league operators and facility owners should consider posting signage warning of such risks. Examples include: “Park At Your Own Risk: Foul Balls and Home Runs May Strike Vehicles” or “FOUL BALL WARNING! Vehicles Parked In This Lot Assume Any And All Liability For Damages Caused By Foul Balls. PARK AT YOUR OWN RISK. However, such signage is not a requirement to trigger an assumption of risk defense. If you found this article to be beneficial, be sure to check out our entire risk management content library and our searchable sports insurance blog for other important information on how to better protect your sports organization. Commotio cordis is a sudden cardiac arrhythmia caused by a direct blow to the chest. It typically results from a low-velocity impact to the chest from a thrown or batted ball, puck or other object typically traveling between 20 and 50 mph. The risk increases the closer the impact is to the center of the heart.Death results when an abnormal rhythm, ventricular fibrillation, develops. However, blood circulation to the heart may also be affected. For commotio cordis to occur, the impact has to be precisely timed to strike the heart during a 15 to 30-millisecond phase of the electrical cycle. It can cause sudden death in young baseball, softball and hockey players, as well as other athletes. The sport with the highest incidence of commotio cordis is baseball, followed by softball, hockey, football, soccer and lacrosse. An overwhelming 95 percent of cases affect males. The most frequently affected age group is 10 to 18 years. Since 1995, the U.S. Commotio Cordis Registry received reports of over 225 cases. Many more unreported cases are suspected of having occurred. The Registry reports a survival rate of 24 percent. While instances of commotio cordis are rare, sadly, the death rate is 90 percent. 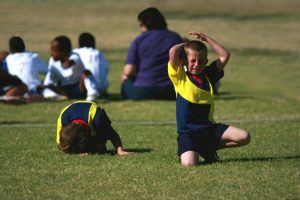 Unfortunately, the lack of response to CPR efforts by healthy young athletes is unexplained. History shows that responding with CPR efforts within three to five minutes is critical. 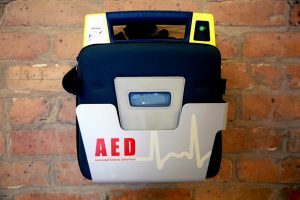 Studies indicate that the chances of surviving an incident of commotio cordis are enhanced if a shock from an automated external defibrillator (AED) can be delivered promptly. Most ballparks don’t have AEDs, and those that do must have well-practiced procedures in place for the rapid use of the device. Otherwise, all is for naught. Researchers have been looking for solutions, typically in the form of chest protectors. But statistics show that somewhere between 20 and 30 percent of commotio cordis victims collapsed while wearing chest protection of some sort. Obviously, this means that the protection athletes were given wasn’t good enough. Educating coaches, players and parents about the importance of preventing precordial blows is critical. For example, baseball and softball players should be taught to step aside or to turn and deflect balls using the shoulder, not the chest wall. Commotio cordis is not related to an underlying heart condition. Therefore, susceptibility cannot be predetermined by a medical screening. Spectators, players, and staff need to be able to recognize the signs of commotio cordis and take immediate action if a player is struck in the chest and collapses. In July 2018, the National Operating Committee on Standards for Athletic Equipment (NOCSAE) set the world’s first performance standard for chest protection from commotio cordis. NOCSAE developed separate versions for baseball and lacrosse. 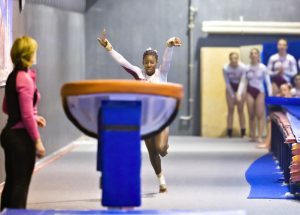 Governing bodies of the various sports will decide whether or not they include compliance with these NOCSAE standards in their rules of play and when that goes into effect. Together with the Louis J. Acompora Memorial Foundation, NOCSAE funded more than $1.1 million in research that pinpointed the cause of commotio cordis, including the critical moment of occurrence. To test impacts to the chest and heart, research engineers then developed a mechanical chest that mimics the human response of the human. All this led to NOCSAE creating the first commotio cordis-specific chest protection standard. NOCSAE looks to reduce the risk of death significantly from commotio cordis for athletes using equipment certified to this new standard. The Safety Equipment Institute (SEI) issued the first certifications for chest protectors that meet NOCSAE’s new standard. The NOCSAE criteria support a test method that produces reliable measurements to evaluate various types of chest protectors. Chest protector manufacturers participating in SEI’s certification program must also have their facility and operations audited for quality assurance. Additionally, all products labeled SEI and NOCSAE-certified must be recertified annually. Yes, all products have to be retested, and the manufacturing facility successfully meets all SEI quality-assurance requirements each year. SEI serves as the world’s premier certification organization for safety and protective products. The standard update for chest protectors resulted in a rule change by the Baseball Rules Committee of the National Federation of State High School Associations (NFHS). Rule 1-5-3, effective January 1, 2020, requires catchers wear chest protectors that meet the NOCSAE standard as the time of manufacture. Knowing that catchers are wearing equipment certified by the latest safety standards provides players, coaches, parents and school administrators assurance that athletes have the best heart protection possible, said Elliot Hopkins, NFHS director of sports and student services. Other youth baseball organizations will need to address whether or not they will follow the lead of NFHS. It’s important to note that neither NOCSAE nor SEI offer any guarantees of protection from the certified chest protectors. They clearly state that no thoracic or chest protector can prevent all cardiac injuries, and that catastrophic injury and death may occur to a wearer of a NOCSAE and SEI-certified protector. Opponents of the new standard point out that neither NOCSAE, SEI, nor any manufacturer can say affirmatively that their product does prevent commotio cordis. Also, many question if the additional expense of compliance is worth protecting the very low number of athletes impacted by this rare condition, especially since there are no guarantees. Others wonder if the new chest protectors may cause unintended consequences such as adding an additional heat layer that may contribute to heat illness. If you found this blog on commotio cordis to be beneficial, please check out our other sports risk management content, and other risk management blog posts. More than two million youth put on their baseball gloves and caps each spring and head for the diamond to participate in America’s pastime. Sadly, a growing number of the pitchers among them will experience serious arm injuries. There’s been a dramatic rise in surgical treatments since the 1990s that repair the ulnar collateral ligament (UCL) in the elbow, such as Tommy John surgery. What’s alarming about that is that the fastest growing category of UCL reconstruction patients are youth and high school pitchers. Youth baseball is increasingly being played as year-round sport or even the only sport for some players, so it’s all too easy to exceed 100 innings in a year. Parents, lured by the hope of college scholarships and even the possibility of a pro career, are encouraged to have their children play on travel teams, in year-round leagues,and participate in showcases. Ironically, a great number of young pitchers suffer micro-tears of the UCL before they’re even drafted. Pitch Smart was introduced in 2014 by Major League Baseball and USA Baseball and offers pitching guidelines for each age group and encourages pitch count limits and resting the arm for extended periods. Making biomechanic analysis more accessible to non-professional players may be a way to reduce UCL injuries in young players. Biomechanics is the study of how the skeletal and muscular systems work under various conditions. For instance, rather than simply measure the the acceleration of the elbow, a biomechanical equation calculates the force on the elbow. The technology of biomechanical analysis enables the correction of certain mechanics that typically can’t been seen with the eye. Fleisig sits on the board of Motus Global, which is looking to commercialize this technology. Motus Global, of which Fleisig is a board member, is looking to commercialize their biomechanical analyzation products to all levels of the sport – professional, collegiate, high school and youth leagues. Fleisig says there are two benefits in the mainstreaming the use of using biomechanics: avoiding injury and improving performance. That’s a win-win. Source: Ben Berkon. “Biomechanics and the Youth Pitching Injury Epidemic,” www.sports.vice.com. 07 Apr 2016. Study shows new chest protector is effective and youth athletes most at risk. Athletic chest protectors are critical to the safety of hockey and lacrosse goalies, baseball/softball catchers, and umpires. There is a wide assortment of chest protectors on the market, most of which have proven to be less than adequate against serious injury and can give a false sense of security. But one manufacturer’s product apparently now offers better protection from potentially fatal blows to the chest. The Unequal Technologies HART Chest Protector have proven 95 percent effective in the prevention of Commotio cordis, according to a study published in The Clinical Journal of Sports Medicine. 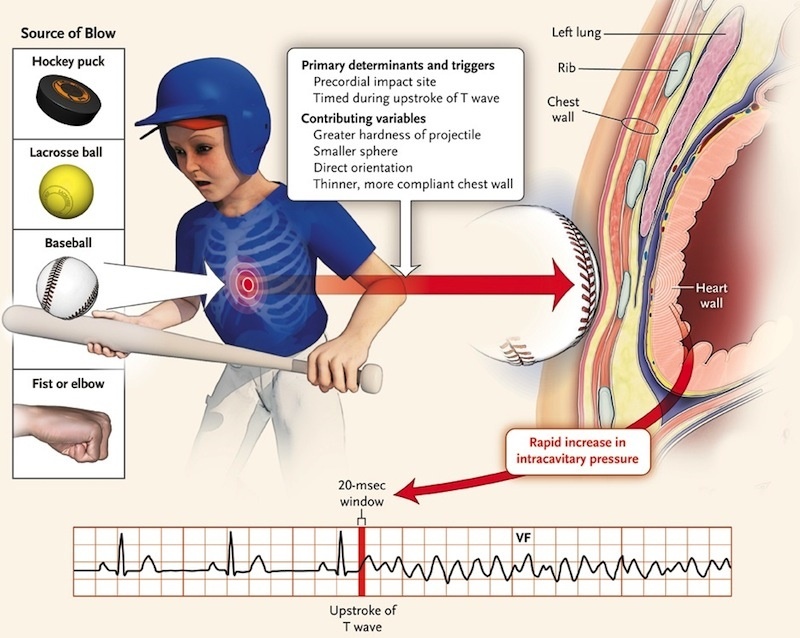 Commotio cordis is a sudden disruption of the cardiac rhythm caused by a forceful impact to the chest that often results in fatal cardiac arrest. Unequal Technologies develops protective padding for a variety of athletic of headgear, including the popular Halo headband. Youth athletes under the age of 16 are most at risk from such incidents. About 10 to 20 cases occur annually in the U.S. More than one-third of Commotio cordis incidents occur in athletes wearing chest protectors, according to a study published in 2013. Therefore, it’s paramount that appropriate padding is properly placed. For more information on Commotio cordis, click here. Source: “Study Finds Unequal Technologies’ Chest Protectors To Be First To Significantly Reduce Risk Cardiac Concussions For Youth Athletes,” www.sporttechie.com. 22 April, 2016. As everyone knows, baseball season is now in full swing. But what many probably don’t know is that youth athletes under the age of 14 incur more eye injuries in baseball and softball than any other sport. In rare instances, these injuries can result in permanent damage or even blindness. Overall, there are more than 40,000 eye injuries reported each year, most occurring in baseball and basketball, followed by water and racquet sports. Balls, bats, pucks, racquets, and sticks are used in the sports that pose the highest risk for eye injuries. These sports also typically include body contact. The leading cause of child blindness in the U.S. is injury, with most cases occurring in sports-related activities, according to the National Eye Institute. Penetration, blunt trauma and radiation are the most common causes of sports-related eye injuries. Exposure to the sun’s ultraviolet rays can result in radiation damage, which can be a particular risk when snow skiing, water skiing and participating in other water and snow sports. According to Jay Novetsky, 90% of sports-related eye injuries are preventable. Novetsky, an eye surgeon at the Vision Institute of Michigan, advocates for protective eyewear as part of every sports’ regulated safety equipment, such as safety shields, safety glasses, goggles and eye guards. To specifically prevent injuries in baseball, batting helmets can be fitted with protective face guards and fielders can wear safety-certified sports goggles. Many people don’t realize that prescription glasses (and sunglasses) worn during play not only don’t offer protection, but they increase the risk of eye injury. Street eyeglasses and contacts can easily shatter upon impact and puncture the eye and surrounding areas. Athletes who wear glasses or contacts can usually have their prescriptions matched in protective eyewear. In order to return to play following an eye injury, the eye should be pain free, cause no discomfort and vision returned to normal. Release by an ophthalmologist should be required before an player with a serious eye injury returns to play. The team physician or athletic trainer should be able to determine if and when players with less serious eye injuries can return. Athletes returning to play following an eye injury should be required to wear eye protection to avoid a second injury. Source: “Baseball Ranks #1 in Sports-related Eye Injuries for Kids.”. www.digitaljournal.com. 14 April, 2016. What should evoke feelings of nostalgia and pride have instead propelled parents at Lexington High School into legal action. The South Carolina school’s aging softball field is in need of improvements, according to Tanya McCraw. Her daughter still plays there where she played while attending the school in the mid 1990s. 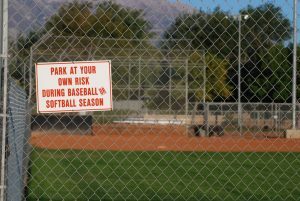 The players’ parents claim the girls’ softball and boys’ baseball facilities are unequal and that their complaints are being ignored. They have filed a Title IX complaint, insisting there are serious safety issues that need addressed. A storm drain in foul territory along left field line is uncovered posing a trip hazard. The home plate backstop isn’t adequately padded to protect players or fans. The outfield is dimly in areas and is riddled by divots from by bands that use the field to practice. The dressing area is so small that players often change their uniforms in their cars. Dugouts are small and have dirt floors that turn to mud during heavy rains. Officials from the school district say minor problems on the field are being addressed but reject claims of any dangerous conditions. The school replaced lights that were burnt out, is removing mold from the concession stand, and already installed plastic piping along the top of the fences. But an upgrade to the 24-year-old field would need to be added to a plan that’s already in development for renovations and new facilities, according to district officials. And that would require voters agreeing to a raise in property taxes. Even then, the improvements wouldn’t be made until 2018. A recent $1.5 million upgrade to the boys’ field include a new backstop, bleachers and dugouts. Funds for that project came from money saved on other project. The boys also have an indoor practice facility, which was built with donated money. School districts and private educational institutions that receive federal funds need to be aware of Title IX and the potential for litigation and should respond accordingly to make sure that illegal disparities between boys and girls facilities don’t exist. Title IX claims and their legal defense may potentially be covered under a Directors & Officers Liability policy depending on how the complaint is worded. Fortunately, all’s well that end’s well. While the school district never admitted to violations of Title IX requirements, they did agree to make upgrades. Upcoming renovations include improved lighting, dugouts, backstop, fencing, sound system, practice facilities. Access to weight training for female players, additional fan seating, improved restrooms and a new concession stand are also in the plans. Read about it here. Source: Tim Flach, “Lexington High’s softball field is unsafe, players’ parents say,” thestate.com. 10 March, 2016. University of Florida senior Lauren Haeger tied Babe Ruth’s record of pitching at least 70 winning games and hitting at least 70 home runs. Nicknamed the Haeger Bomb, the Gator pitcher is a wildly popular player who boosted ESPN’s prime-time broadcast of the last three games of the Women’s College World Series to 2 million. Haeger is idolized by thousands of young softball playing girls who want to be just like her. “It’s great to be a role model for them and show them it can happen because I was once in their shoes,” said Haeger. Haeger is a product of the UF athletic program, which is serious about gender equity. Athletic director Jeremy Foley has watched his Gator teams win the SEC All-Sports Trophy 22 of the last 23 years and 14 national titles since 2008 (more than than any school in the country). The UF women have won 10 national titles in the last five years. Source: Mike Bianchi, “Bianchi: Haeger’s sunflower power is reason Gators softball outdraws NHL,” orlandosentinel.com, 06 June, 2015.